Dearborn Street, Chicago. Photo: Steven E. Gross. 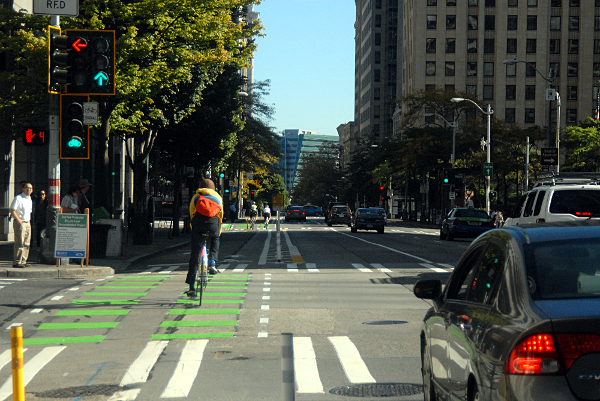 Protected bike lanes are good at making it safer to bike. But they are great at making it safer to walk. As dozens of thought leaders on street safety gather in New York City this morning for the Vision Zero for Cities Symposium, some of them will be discussing this little-known fact: on New York streets that received protected bike lanes from 2007 to 2011, total traffic injury rates – most of which, in New York, injure people walking – fell by 12 to 52 percent. 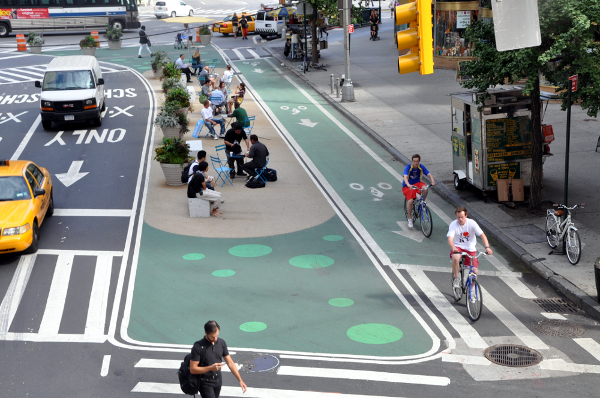 Why would bike infrastructure be so good for people walking? It comes down mostly to four factors. This is probably the most obvious benefit of protected bike lanes to people walking: you don’t have to walk across as many lanes of auto traffic when you cross the street. “Pretty much the most effective thing we can do for pedestrian safety is get rid of mixed-traffic lanes that shouldn’t be there either because the streets are overbuilt or that the way they work is different from the way they were designed,” said Roe, who now directs the Designing Cities Initiative for the National Association of City Transportation Officials. When you’re walking, it’s not the traffic you expect that hits you — it’s the traffic you don’t expect. 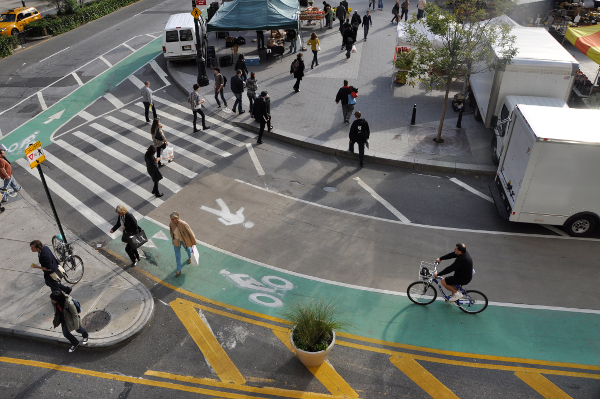 By reducing the number of mixed traffic lanes, protected bike lane projects effectively break each pedestrian street crossing into manageable stages, all of which include tightly defined vehicle movements. For decades, people have been told not to bike on sidewalks because people using the same street in cars wouldn’t be able to see them and might turn directly into them. Right and left hooks into crosswalks, hitting people who are following walk signals correctly but are hidden from a driver behind a parked car, are frequent causes of walking deaths. But the same traffic signals that give people biking a head start on traffic or a green light of their very own can also be used by people walking, and the same daylighting and mixing zones that make it easier for cars to see bikes while turning have exactly the same effect on increasing the visibility of people walking. Another of the maneouvers that are most fatal to people walking are zip-arounds: people swerving their car from one lane to another to get around a stopped car, only to realize the car had stopped because it was yielding to someone in the crosswalk. 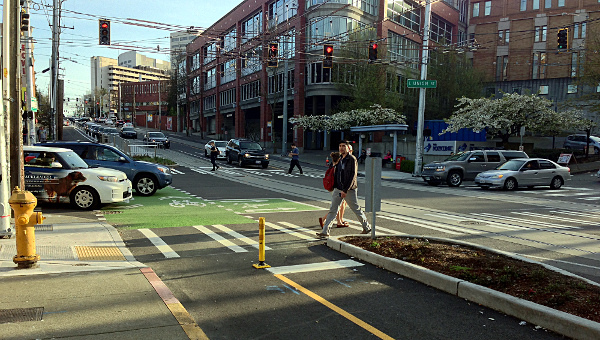 Protected lanes help solve this problem by creating traffic-calming barriers that drivers slow down to avoid and by narrowing or removing the mixed-traffic lanes that are available to cars. When a street has more auto capacity than it actually needs, Roe said, people start making bad choices. But redesigning a street that has an unnecessary mixed-traffic lane into a street with a protected bike lane can have dramatic effects on street safety, Roe said. Once zip-arounds become impossible, people driving simply queue up to wait their turn — and people walking are, once again, the biggest winners.